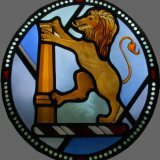 If you would like to discuss your design ideas for a new stained glass window or decorative window design please contact us. SDL Stained Glass has designed windows for religious buildings, public buildings and private residences. Whatever your requirement, please contact us today.